Exposed to the elements, they play a crucial role in protecting the roof space and rafters of your home. They may go unnoticed most of the time, but old, rotten or discoloured timber fascias and soffits can spoil the look of your property and cause expensive damage to your roof rafters. Roofline products are just as important as your double glazing. 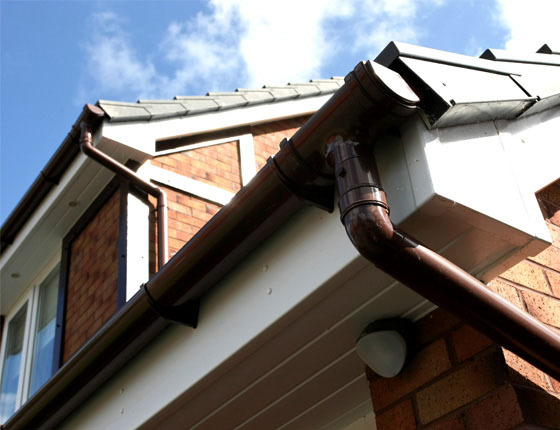 Not only keeping the look of your home presentable and smart but safe from rotting rafter ends, damp and leaking gutters, nesting and structural damage. We provide total removal where possible of existing soffits, fascia, barge boards, guttering and downpipes whilst also replacing waterproof membrane, rotten rafter ends and adding much needed ventilation into the eves space. The general flow and water collection is often much improved. 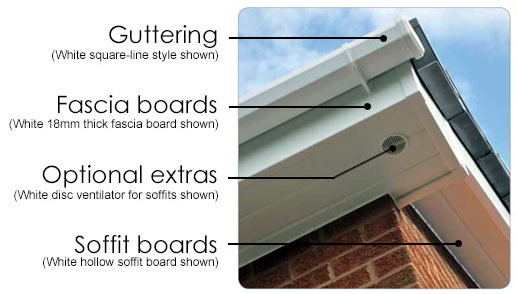 Our soffits and fascia use the best product to ensure quality and performance. All products are non-lead formulation and complies with EEC and PVC industry guidance. 10 year product guarantee on white and 10 years on coloured. BBA and BSI certification (kitemarked). Manufactured to ISO 14001 environmental management standards.